Some things worked well, other things did not. Afterwards I remarked that I really needed a co-GM whose sole task was to keep whispering in my ear “Too complex, make it simpler”.` That we only completed four full turns in four hours means I failed to design the time structures of the game – I had wanted to complete eight game turns. This was largely due to the large number of teams (eight), and the land mechanics being too complex. The map also ended up being a bit cluttered. Some things did work well. The map itself was pretty to look at, although we had some stability issues on the tiny tables. Marking hex terrain with a thick coloured border around the hex also worked very well. Next time I should try and get hold of a decent wargaming table to mount the map on. The physical appearance of the game counters was also good. I spent a few hundred dollars on dice, leader stands, and wooden/plastic tokens from The Game Crafter and from http://www.blankdice.co.uk/. I also used sticky labels printed out on my laserprinter for the counters, rather than spray adhesive. Overall it was a better looking game, and an easier to assemble game than most of the games I have done in the past. Lots of reuseability in the components, so people will see them again. I also think the pre-game strategic options and diplomacy worked well. It also meant I had to have the game 99% finished a week before the Con, rather than the night before the con. It also motivated me to actually throw some content on my www.housewar.org website. This had room for improvement, as I failed to take into account that some people would be too busy in the week beforehand. Ideally people should be able to delegate or select proxies. It was a real buzz for me to walk into the Con at 0900 and find people already plotting for the Grand Strategy game that night. The picture above shows the state of the game at the end of the night. A few cities and sea zones had changed hands, but because the Orange-Black, White-Green wars had been largely one on one affrays, no truly decisive land action had taken place. The neutral islands had been occupied, so if the game had lasted longer, the sideline players would have started intervening. Naval combat did not start until turns 3-4. What this tells me is that I had too many sea areas for the number of naval forces in the game, and that everyone was more interested in dividing up and grabbing colonies rather than fighting each other. So one simple fix there is to start teams with island colonies, and to reduce the number of sea areas down a bit. Naval movement and combat worked well. Land movement and combat did not. As well as some rules complexity, people found it to hard to see what was happening on the front lines. The leader stands hindered as much as they helped, as people found it hard to calculate hex radius distances, and the support units cluttered up the map. The off-map reserves really needed better mechanics for voluntary deployment and removal, as it encouraged players to do counter-intuitive meta-game tactics, like deliberately leaving gaps in their line and trusting their neighbour not to exploit. Amphibious movement and invasions were too complex and time consuming given the brief number of game turns completed. Almost no one chose Guards units as a strategic option, which makes me think that I should have called the units Marines, as they were actually the best units to do an amphibious attack with. Trade mostly took place away from the map room, I have no idea how well that worked, but at least we didn’t run out of cards this year. I did get feedback on the night that players wanted to build units. I am thinking about this. 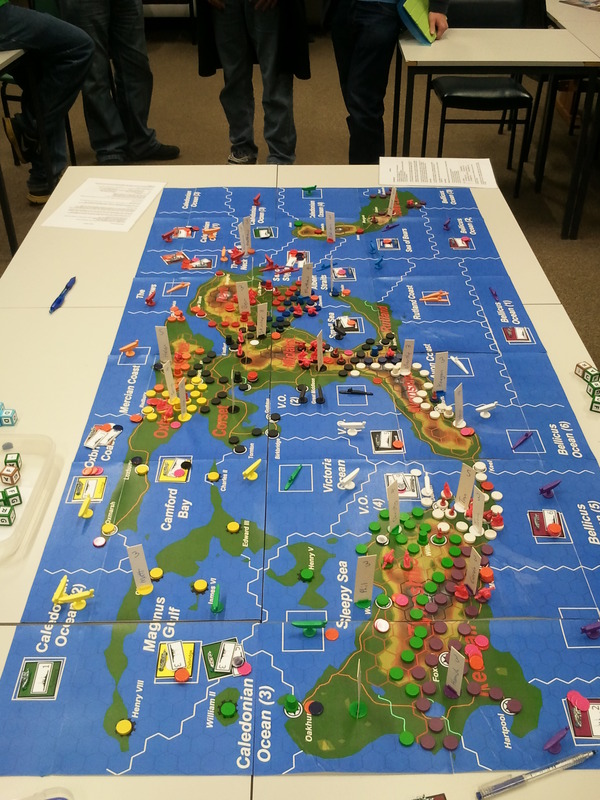 I tried keeping the game simple by having the builds effectively take place before the game began, but several teams wanted the option of building up their navy mid-game and it just wasn’t possible in the Rules As Written. This is something I will work on for the next version. With eight teams, teams were averaging around five to six minutes for a game turn, not the two minutes I had hoped for. If I had built a second map just for naval actions, then I could have split the moves up a bit and had less overall downtime for the teams. The bonus action (“The Big Push”) was ignored by some teams early on, then towards the end everyone bet big on it, which told me both that the economy was generating too many resources and everyone had figured out how important a second full action was. The “shells” on the game map proved too fiddly to keep track of, so I would dump them from the game. A lot of teams, when they got to the map, tended to give orders by telling each other what to do, not by telling a Gm what they were going to do. It makes me think that going back to the old, old system of the team leader having a free minute at the start of a team’s turn to look at the map and give orders, followed by a set time of the team’s minions moving pieces and not talking except to tell a GM they are attacking, might be a better system for getting things done quickly. I liked the game enough, that I will run it again at Kapcon 2014. So people in Wellington or further afield, now is your chance to volunteer to help out. For my 2014 Buckets game, I am pondering about running To Reign in Hell, a game where the players represent legions of Demons trying to take over Hell. I’m sure I can adapt Dante’s classic map somehow. I’ll have another blog post on Pax Vicky in a couple of weeks when the survey I am running concludes. I also ran a simple Dragon Age tabletop game, where the players were Djinn working for the Ottoman Empire in an alternate history 1960s. A successful investigation of a dodgy hospital exploiting a leper colony in Jerusalem ended with icky alien bug like things being squished. The stunt system worked well at making the characters look baddass, so Dragon Age may become my convention system of choice. I enjoyed the Dresden Files LARP on Sunday night of Kapcon. It helped that I was paired up with an extrovert who was my long lost brother, and we had fun roleplaying crazy Russians on Circe’s Island. Which sank. But I freed my brother from being a vampire’s thrall, earned brownie points wit the Catholic Church for retrieving one of the holy swords of the cross for them, did not get hunted down the Warden, did facilitate the defection of a White Council member to the Red Court, and got a free ride to Paris from the Queen of Summer. Not bad for a poor boy from the Ukraine who can talk to the (mostly) dead. Successful game design requires iteration. Iteration requires you to recognise that your brilliant idea is not going to work, and then coming up with a new brilliant idea. Which probably won’t work either, but at least it feels like progress! (5) An economics/logistics system to allow units to be built/replaced and to track economic fatigue and eventual economic collapse. I’m well into my third iteration for all except the diplomacy rules. For the second iteration I made my usual mistake of creating a dice game, and after a couple of happy days of meshing all the synergies together, I remembered what a PITA it is for GMs to spend time sorting dice and figuring out if a roll was good/bad hit/miss critical/boring and then implementing it in game. So I took the numbers and underlying math and turned them into a card game of sorts. Railway networks and supply lines are important. Industrial armies cannot survive by living off the land. If their supply line is cut they collapse quickly. Cavalry units are largely ineffective, unless a gap is created for them, or their opponents are weak. Fortresses are situationally powerful. Build them in the right place and they work like magic, build them in the wrong place and watch the enemy ignore them. Mobilisation of reserve forces is important. Enveloping units on multiple flanks, or pressing on all sides of a salient, is a tactically strong move. In a battle of resources, it makes strategic sense for an economically powerful country to focus on attrition, while a militarily powerful nation will be striving for the “Short, victorious war” beloved of politicians down through the ages. a stamina rating of zero to two. A Guards unit is an elite infantry unit. These will be limited in number. Guards units are tough, the only unit at reduced strength with a strength greater than one, and the only unit with a stamina of two for a glorious last stand around the regimental colours. Artillery is a support unit. Like Guards, Artillery will be in short supply. Special Ability: Because there will only be one unit in most hexes, artillery contribute their strength to any battle within two hexes of the hex they occupy. Special Weakness: Artillery are the strongest land unit in the game, but at full strength they have a stamina of zero, so if involved in combat they must automatically flip to half strength. This will make it hard to sustain attacks, as sooner or later you will need to resupply your artillery units back to full strength to keep attacking. The standard army unit, no special abilities or features, other than being the most common unit on the map. All nations will have a similar number of Regular units. Reserve units do not start the game on the map. They must be built during the game. Nations will have very different reserve force pools, based on their grand strategy. Effectively a weaker version of the Regular unit, but cheaper to build, and in quantity they have their own quality. The last of the limited number elite units, Cavalry are good for rapid advances against light opposition or exploiting gaps in weak defensive lines. Attacking solid defences, not so good. Special Ability: If a gap is created in the enemy lines to the green fields beyond, cavalry units can move to the gap, and then onwards one hex into vacant enemy territory. A Headquarters (HQ) is a supply source. If attacked in combat it collapses as Generals flee for safety. It counts as a Rail hex, so if you form a continuous chain of HQs you can carry supplies deep into the wilderness, or use the HQ line to bring reinforcements into the campaign. A strong defensive unit that is immobile. Good for defending cities, railway junctions, or key border crossings. Special Abilities: (1) Acts like an artillery unit for support, but does not flip. (2) Can have a garrison unit stacked with it (3) Increase the Stamina of any garrison unit by +1 (4) Acts as source of supply for its Hex (5) Counts as a rail hex. So those are the units. Apart from Forts, I am keen to avoid any kind of stacking on the map, single counters are far faster to count and so will help players make good informed decisions in less time. As for the crunchy bit of combat, after playing around with die rolls and realising that would be too hard I thought about a system where you pulled one card from a deck per stamina point the defending unit has. Today I had the brainwave that it would be faster to pre-print cards with multiple entries for Stamina-1, Stamina-2, Stamina-3 etc. Each Stamina line has a number, which is the total strength the combined attacking units require to defeat the defender and force a retreat. Each line will be 1-10 strength, average of 6, accumulating over the lines. So if attacking a Regular unit (Stamina 1), if you draw a card and get six on the Stamina-1 line, then if you are attacking with only a Guards unit (Strength 5) you fail, but if attacking with two Reserve Units (Strength 3 x 2 =6) you succeed. Units would get a +1 stamina bonus for defending beaches, cities, mountains or rivers. The defending unit is always reduced in strength by the attack, unless the card has a symbol indicating that the defender does not flip (I’m thinking of having this on about 10% of the cards). The attacker flips a number of units equal to the defender’s stamina, plus all supporting artillery. I may have symbols on a few cards (10-30% of the deck perhaps) indicating that elite units have their effective strength increased, perhaps even doubled, for that battle. So while overall outcomes are predictable, there is enough variation to keep it interesting. So how do you win a land war in the Southeast Colonies? 1. Attack reduced strength or stamina 0 units, with full strength units. A destroyed unit costs more to build than a half strength unit costs to reinforce. 2. Envelop or surround a unit so you can attack with 3+ units, increasing your strength to guarantee a forced retreat. If you keep taking a hex a turn, after a few turns you will be in their capital city. 3. Use overwhelming force, Guard units supported by artillery can smash through on a narrow one hex front if the defender does not have stamina boosting terrain, Strength 5 + Strength 6 = Strength 11 total versus a maximum of Strength 10 on the One Stamina line of a Battle card. 4. Bloody Attrition, from a position of economic strength attack with expendable units so that you create a situation where (1) is possible. 5. Counterattack, wait for them to attack you when you are in stamina boosting terrain, then counterattack while they are weak. Both 1 and 5 are going to depend a on when teams draw their logistic chits (the number of which you have are determined by pre-game grand strategy choices). Its going to be nerve wracking to see if the reinforcements arrive in time for the big push, or whether you signal to home that its been delayed by mud. I need to ponder the naval combat design for a while longer, but I can probably do a post soon on how I see the pre-game Grand Strategy choices working. I also need to do some thinking on the economics. I found some economic analysis of GDP figures in World War One recently, and while the USA and UK had GDP growth during the war, all the other great powers lost a large chunk of GDP, despite massive increases in the government share of GDP. So while a wartime economy works, more or less, it does not create an infinite supply train of resources, so I suspect peak wartime strength might only be around 20% above fully mobilised pre-war strength. A bit of 2000AD influence here, but the concept for Pax Victoria is an isolated colony world, where a trillionaire businesswoman has established herself as Queen-Emperor Victoria II for a couple of centuries. Funded by a monopoly on sales of Blood Diamonds harvested from fearsome leviathans of the ocean deeps, Victoria II has established a romanticised neo-Victorian colony world. The upper tier of aristocracy have access to galactic technology, imported from off-world and maintained by the “Butler” class. The other colonists are restricted to pre-1900 technology, except for a few educational and medicinal facilities. So the colony is mainly steam-powered, save for the shuttle port (which galactic regulations require to have modern facilities for dealing with lost and damaged starships, so it has a small atomic power plant). Victoria II has had a long reign, and through life extension technology she has celebrated a 200 year jubilee. From time to time she has taken lovers as Prince Consorts, before plunging into decade long bouts of mourning following the consorts tragic early demise. Her children, the darling princelings, have grown into administrative duties as they have matured. The local natives are convinced of the divine origins of the off-worlders, and have signed a number of unfavourable 999 year leases, but nothing so bad as to trigger the anti-slavery clauses in the Galactic Constitution. So while some rebels do strike from the jungles, the Sepoy units of the Imperial Army are usually sufficient to defeat them, and if not, the Imperial Guard has the Maxim Machine Gun 3000, and they do not. Their victory objectives for the game. Their stance on political issues relating to the status quo or societal change. Their preferred options for force build up. gain control of disputed territory. For each stretch goal, you gain an extra option point, but also acquire a victory point penalty (i.e. if you go for Napoleonic world conquest and fail, then you will lose the game of grand strategy, while someone choosing a Switzerland approach may find their goals easier to obtain). I will describe these in qualitative terms, I will keep the maths hidden until the end of the game. I would probably have some threshold effects, such as gain +1 action token per additional state you conquer so that world conquest is possible (if not exactly probable) so that players choosing that gamble should at least have a fun time executing it. The players are Lords. They run their states like petty fiefdoms. This does not make them popular, but the players can choose between political stances that will increase or reduce the stability of their states. Stability will change the chance of either the natives rebelling against the humans, or the common humans attempting a revolution to take power of their own. Some stances may also change the number of option points available. The final set of political stances will also determine how many victory points it costs to ally with other players (the greater the difference in stances, the higher the victory point cost). supporting the World Empire or balkanisation of the colony. A stable state may not be as powerful, but it will not be home to the first rebellion/revolution (which is how I can respawn into the game any players whose states are conquered by other teams early in the game). Options represent an investment of energy, leadership and labour in preparing for the end of the Pax Victoria. Most of the options are things players will want to do, but it will be impossible to do all of them. The teams will each pick an option every day in the lead up to the game night (hopefully by consensus, if they disagree I would pick one randomly and reduce state stability). The earlier a team picks an option, the more powerful it will be for them in the game. For example, setting up a spy agency early on gives you a lot of spies in the game. Setting up a spy agency as your last option gives you a small, pitifully underfunded agency. The goal would be to minimise the chance of one option being a clear game winner. Ideally at the start of the game the different teams will have a mix of forces and abilities that avoid them being carbon copies of each other. The design intent is to make Naval power much more important than it was in Flower Power. The idea is to borrow and adjust the Circle Sea setting from Andrew Vallance’s epic play-by-mail game of yesteryear. So imagine an ocean on a water world. Now imagine a comet smacking into the world. The crater that is left behind leaves a dimple island in the middle, with an outer circle of the crater wall. Have a couple of straits eroded in the walls and you have two long crescents of land. Each of the two continents have five teams of players on it. Each team has at least one land neighbour, and usually 2-3, and has naval ports bordering on two oceans. So players have some big choices to make. It will be impossible for any team to have both a superior inner sea navy and an outer sea navy, and an army/air force superior to all of their neighbours. Each state will be weak somewhere. This should encourage diplomacy, alliances … and betrayal. Ground combat will be attrition based in outcomes, resulting in small amounts of positional movement and army losses. As long as a state has selected options that allow them to train and equip replacements faster than they take losses, their army will remain solidly on the field (unless backed into a corner and forced to retreat, or if being attacked by more than one player at a time). Ground combat is at the Army level, with elite corps sized units. Each Army has around ten tokens, which are placed in hexes to represent “front lines”. The airforce will play a role in supporting army/navy combat, unless a state decides to spend a stupendous number of option points developing a strategic bomber force. Naval combat is based on having superiority in a sea zone, and is much more likely to result in a decisive battle than ground combat. Outnumbered naval forces will tend to hide in fortified naval bases, only poking their heads out to do raids. Naval combat is at the squadron/fleet level. We probably have two map tables for land operations, and a third map table for naval operations. Assuming a 20 minute turn and 30 players, so 10 players per table, if turns can be executed in 30 seconds, players can be allowed four actions per turn. If they take a minute to complete, then two actions per turn. To help focus players, we probably make it hard for states to have more than three combat units per player. Using a HAT system, each state gets a number of tokens equal to its number of players, plus some tokens based on options. The default token is “Hasty Assault” (i.e. extra casualties for the attacker), but depending on how the state spent options it may get different, or additional tokens such as “Supply”, “Prepared Defence” (i.e. reduce defender losses if attacked, increase attacker losses) and “Prepared Assault” (i.e. bonus for artillery). Exhaustion: once an army has attacked, it is exhausted. It cannot attack again until either the next game turn starts, or some logistic resources are expended in a supply action. It also suffers a penalty if attacked. This should make players less frantic to be the first to move … so when a team is called up for an action, they have a few seconds in which they can choose to pass and wait. In some ways, executing the last move can be advantageous (so the end of the game turn may be 20 minutes +30-120 seconds at random). Anyhow, that is one possible scenario for next year’s Grand Strategy game. First, a couple of links. Recently I read Edward Luttwak’s Grand Strategy of the Byzantine Empire, which gave me a few new ideas about how to do a Decline & Fall game. The Byzantine’s had a strategic problem, of having infinite enemies. If they wiped out a group of barbarians, they risked losing the entire army in battle, were down coin and soldiers if they won, captured nothing of value, and got to watch more barbarians migrate into the space where the old barbarians used to be a few years later. This led to an operational strategy of avoiding combat, and using diplomacy to play the barbarians off against each other. Not a bad strategy, as it worked for the best part of a thousand years. capture the Imperial capital and any other three capitals. So part of the game is trying to figure out what objectives the other players have, and trying to interfere with that where possible. Players start on the frontier, with their horde. Some specific Imperial defences/monuments are placed on the map, then each player places an Imperial defence unit and a monument. As Imperial defences are destroyed, the player that destroyed them can reset the defence unit in front of one of the other barbarian hordes (a mechanic used in an old WWII Pacific game called Hit the Beach). As players advance, they gain loot from capturing Imperial territory. Each turn they can gain some recruits from frontier zones they control, and continue the invasion into fresh Imeprial territory where more loot awaits. Or they can stop movement for a turn, and spend loot to recruit forces, including special capability units. When they stop to build like this, they also get to repair damaged Imperial defences (the ones in front of other players of course). Potentially the Imperial defences could get quite hard to penetrate towards the end game, so doing some building should be a good chocie at some point during the mid-game, although I think the early game will be all about grabbing as much as possible. As a twist, their are two (or more) piles of Imperial loot, which increases by one token of loot a turn. A player can choose to take the Emperor’s coin for a turn, and take one of these loot piles. During that turn they are a Warlord recognised by the Empire, so they cannot attack the Empire and score extra points for attacking other barbarians. … tomorrow night, I should find time to post about the next set of ideas for the Bucjets Grand Strategy (in summary, no dice, and change agents into barbarians).